With all the talk about mark to market accounting, nobody seems to care that US pensions do not use these accounting principles when determining the present value of their liabilities. Pensions mark to market their bond portfolio based on current rates and spread levels (i.e. current yield/spread curve). However liabilities are discounted using a 2-year average of the investment grade corporate curve (see attached document for the latest rates). That means that pension liabilities are currently undervalued relative to pension assets because rates have come down so sharply in the past two years. One would think however that in the next two years this problem should correct itself as low rates get reflected in the average. As the 2-year average starts including these low rates and liabilities become worth more on a present value basis, an increasing number of pensions will become underfunded and corporations will be required to inject more capital. And that in fact has already been taking place. Treasury and Risk: - Corporate contributions to defined-benefit pension plans have been rising, reflecting the damage done to plan assets by the financial crisis and recession and the boost to plan liabilities that results from record low interest rates. A study published last fall by the Society of Actuaries showed that in the decade that ended in 2009, companies’ cash contributions to their plans averaged about $66 billion a year. The study estimates that minimum required contributions will average $90 billion a year in the decade that started in 2010 and hit a peak of about $140 billion in 2016. But no worries - the corporate pension lobby was able to get to the US politicians before the really low rates got into the average. And the politicians snuck in a little provision into (of all places) the Transportation Spending bill that was recently passed by the US Senate changing the rolling 2-year averaging into a 25 (twenty five) - year average. Rates of course were significantly higher in the past 25 years than they are now and will likely be in the next few years. MERCATUS CENTER AT GEORGE MASON UNIVERSITY: - The provision in the Senate-passed version of the Transportation bill currently under consideration in the House would allow corporations to use a 25-year average rate as opposed to the current 2-year average, increasing the current discount rate from the 4 percent range to roughly 6 percent. Since liabilities are sensitive to discount rate assumptions, the plan's liability will change roughly 15 percent for every one percentage point change in the discount rate. For example, Boeing reports that a mere quarter of a point increase in the discount rate could cut its pension liability by $1.7 billion. Apply a small discount rate hike across all private plans and it's easy to see why corporations are lobbying Congress for a discount rate boost. 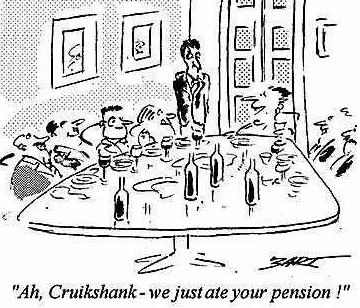 All of a sudden pensions will no longer look underfunded. Accounting magic! JPMorgan: - This artificially low sensitivity [the two-year smoothing] of US pension liabilities to market rates is set to decline even further under new rules being proposed by Congress as part of the Transportation Spending bill passed by the Senate in March (S. 1813) and now being considered by the House. Buried on page 1472 of the bill are new rules on “Pension Funding Stabilization” that effectively put a corridor on the discount rate used to value pension liabilities. The upper bound of this corridor is equal to a rolling 25-year average of the IRS published corporate bond yield scaled up by a factor (110% for 2012, 115% for 2013, trending up to 130% for 2016 and beyond); the lower bound equals a rolling 25-year average of the IRS published corporate bond yield scaled down by a factor (90% for 2012, 85% for 2013 and trending down to 70% for 2016 and beyond). The 25-year average greatly increases the smoothing effect, further reducing the reported sensitivity of pension fund liabilities to changes in market interest rates. Why do we care? Again, the taxpayer is very much at risk here. As discussed before, the US pension bailout fund PBGC is already stretched and may require more taxpayer money. Now it would be taking over pensions that will be even more underfunded, with asset values way below the present value of the liabilities. And more of taxpayers' money will be used to fund the benefit payments.